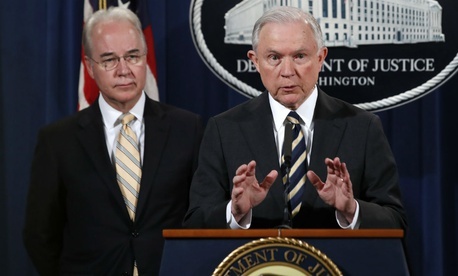 The Justice Department has charged hundreds with health care fraud after a nationwide investigation revealed $1.3 billion in illegitimate insurance claims. In what the department billed as the largest health care fraud takedown ever, officials indicted 412 individuals, including 115 doctors, nurses and medical professionals, for allegedly participating in fraud schemes across 41 federal districts in 30 different states. Additionally, 120 people were charged for unnecessarily providing and distributing opioids and other narcotics, and the Health and Human Services Department and issued suspensions against 295 health care providers. The effort was part of the federal government’s attempts to curb improper payments to beneficiaries of large programs such as Medicare, which were estimated at $137 billion governmentwide as of fiscal 2015. The fraud investigation targeted schemes to bill Medicare, Medicaid and TRICARE — an insurance program for military members and their families — for unnecessary and often undistributed treatments. In such scenarios, co-conspirators often received kickbacks for providing medical professionals with beneficiary information, which was then used to file fraudulent bills. Officials say these schemes can give patients easier access to prescriptions and fault the defendants in helping fuel the opioid epidemic plaguing many regions of the United States. Many of the operations busted in the recent investigation specifically targeted addiction patients. Since 2007, the Justice’s Medicare Fraud Strike Force has charged more than 3,500 individuals in falsely billing the Medicare program for a combined $12.5 billion.